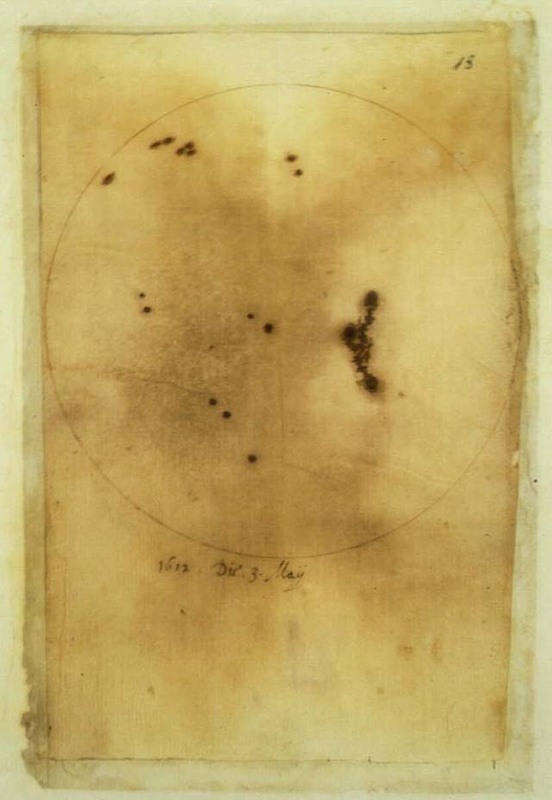 In the summer of 1612, Galileo sketched a series of sunspots which were published in Istoria e Dimostrazioni Intorno Alle Macchie Solari e Loro Accidenti Rome, (History and Demonstrations Concerning Sunspots and their Properties), in 1613. Galileo corresponded with other scientists and artists who also were sketching the sun in the early 1600′s. He used a 16mm, f/11 Galilean refractor, and many drawings are known to have survived. He observed the sun using attenuated eyepiece (attenuated by Earth’s atmosphere when the Sun was low on the horizon at dusk) and eyepiece projection techniques. A lot of people repeat the story (which is really just an urban legend) that Galileo became blind by looking at the Sun through his telescope. He went blind in 1672, from a combination of cataracts and glaucoma more than half a century after publishing his sunspot sketches. In his sunspot letters to Mark Welser, dated May 4, 1612, Galileo mentions observing the Sun directly — but only at sunset. In its final paragraph, he mentions that his pupil Benedetto Castelli has discovered a better way to observe – using a projection method. 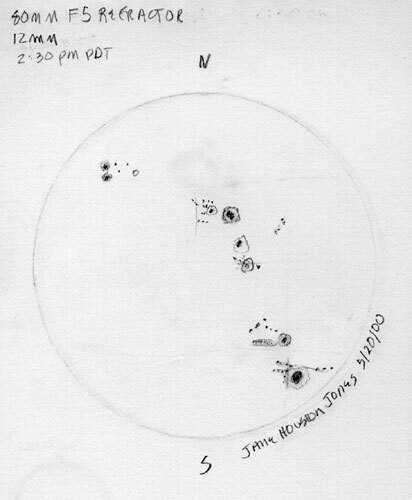 My sunspot drawings were made mostly in 2002, near solar maximum, so I was able to see and sketch and classify hundreds of sunspots and other solar features. The one pictured here was made a few years earlier, tho’. I used three telescopes for my observations, a homemade bright yellow 6-inch f/10 Dobsonian reflector which I made in John Dobson’s telescope making class, an Orion 80mm refractor with a white-light solar filter and a Televue 70mm Ranger refractor with a Coronado h-alpha filter. I used these instruments to make daily sketches over two solar rotations (about 2 months) and completed the Astronomical League’s Sunspotter Club observing program. My 2002 solar sketches are linked below.